The Heavy dropsuit is a second-generation solution designed to withstand concentrated small arms fire and protect the wearer from the concussive, thermal, and impact forces of low-grade explosives. Additionally, its power-assisted exoskeleton facilitates usage of the heaviest caliber personal weapons. Every vital area of the wearer is protected by 25mm of composite ceramic shell or high tensile steel plates, layered with impact absorbing, compressed carbon latticework. A secondary thermal dispersion membrane channels excess heat away from the point of contact, distributing it over a larger surface area and thereby lessening the potential damage. Superconductive veins of hybrid silver coat the outer layers and connect every piece of the armor to a grounding heat sink, dampening the harmful effects of direct fire electromagnetic weaponry. 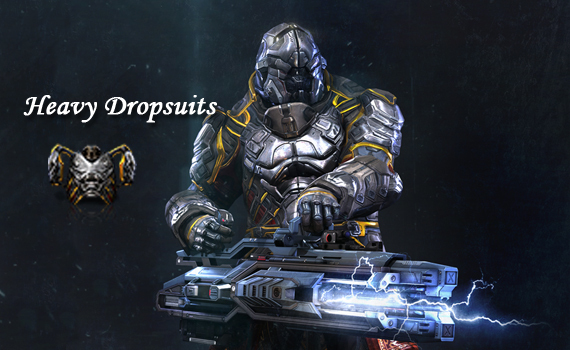 Heavy dropsuits lack the mobility of lighter suits, but this trade-off results in a defensive system that defies standard infantry conventions. No other classification of personal armor can claim to be able to stand toe-to-toe with enemy vehicles and survive.